The UWB-3 is a new RFSPACE Ultra-Wideband (UWB) Vivaldi antenna. This antenna is optimized for L and S band. These antennas are built on aluminum with a printed circuit board feed assembly. Each antenna is guaranteed to cover the 875 MHz to 6 GHz + continuously. Each antenna is individually tested and tuned to cover the complete band. Typical performance is an SWR < 2.5:1 over the whole 875-6000+ MHz range. 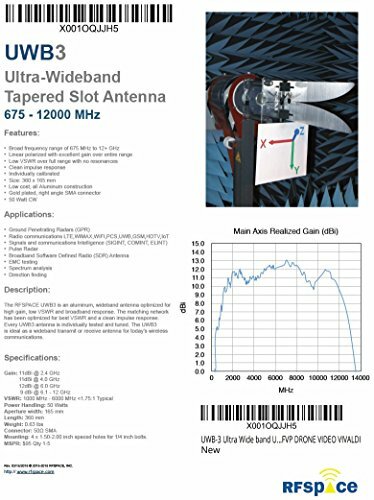 This is the ultimate broadband antenna for wideband SDRs. These antennas also exhibit a very clean impulse response with low ringing. These antennas are great for the following applications: • Ground Penetrating Radars (GPR) • RTL-Dongle wideband antenna • Radio communications LTE,WIMAX,WIFI,PCS,UWB,GSM,IoT • Signals and communications Intelligence (SIGINT, COMINT, ELINT) • 5.8 GHz FPV / Drone comms • Broadband Software Defined Radio (SDR) Antenna • EMC testing • Spectrum analysis • Direction finding. Compatible with Agilent and Rohde and Schwarz spectrum analyzers. Ultra Wideband - 875 MHz to 6000 MHz+ coverage. Usable to 12 GHz. If you have any questions about this product by RFSPACE, contact us by completing and submitting the form below. If you are looking for a specif part number, please include it with your message.